I ran my first 20-miler in what seems like forever today. The route, above, worked out really well. 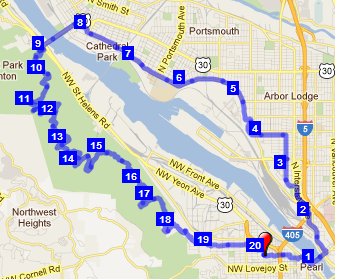 Running over the St. John’s Bridge in far North Portland is fun (as anyone who’s run the Portland Marathon can tell you) but running on NW St Helens Rd/Highway 30 to get there or back is not (as anyone who’s run the Portland Marathon can also tell you). But you can detour around that by taking Forest Park’s Ridge Trail, which connects the south end of the bridge to milepost 8.5 of Leif Erickson Drive. If you finish the loop across the Broadway Bridge, it works out to almost exactly 20 miles, all on sidewalks or trails and with few busy road crossings. I mostly walked going up the trail. It was in pretty good shape, especially considering all the rain we’ve had lately. The rain continued during my run and there were lots and lots of puddles everywhere. For a while I tried to go around them, and found myself irritated every time I drifted off and stepped in one. But after three or four miles I gave up on keeping my shoes dry and just waded through. My feet were sore by the end of the run, but other than that, all good. You are currently browsing the I'd Rather be Running blog archives for March, 2012.